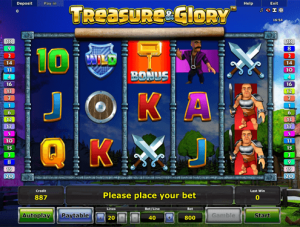 A Tale of Treasure & Glory is a very intriguing slot game from Novomatic. It really does tell a tale! When you first open the slot game, the tale will begin. In the game, you are a warrior who lives in a medieval-style village. On the scroll, you’ll read that an evil sorcerer has taken your village gold and hidden it within the walls of his castle. Your armour is heavy and your weapon of choice is a big hammer! When you get the bonus, you’ll have the chance to knock down the wall of the sorcerer’s castle and take back what’s yours! Not only will you win back your village’s treasure but you’ll also win all the glory. This is one of Novomatic’s more interactive slot games which makes it extra enjoyable to play. Although, if you are a classic fruit slot fan, this probably isn’t the right choice for you. On the left side of the reels, you can see the evil sorcerer’s castle, hidden in darkness. On the right side of the reels, you can see your quaint medieval village, complete with a snoozing villager, a cottage and a windmill. The bonus game is really fun and it has two elements to it, so if you get through the first round, you could be in for a massive win! Other fun, interactive slots you can find here at NovomaticCasino.co.uk are: Sizzling Hot Deluxe, Monkey’s Millions, Kingdom of Legend, Cops n Robbers Millionaires Row and Rumble in the Jungle. Treasure & Glory wich you can play at the Novomatic casino has an RTP of 95.20%. They way you get wins is by spinning as many identical symbols as possible across the paylines. The maximum number of paylines you can bet on is 20 but you can bet on fewer, if you want. Your bet per line will affect the payout values for the symbol and the more you bet, the bigger the payouts will be. The paylines in this quirky video slot pay just one way, which is from the left-hand side towards the right-hand side. Therefore, to get payouts for the symbols, you have to spin the same symbol on at least reel 1, reel 2 and reel 3 (minimum payout x3 matches) on positions that follow the path of a payline. All of the symbols give a minimum payouts for x3 matches, as well as a payout for x4 matches (across 4 reels) and x5 matches (across all 5 reels). 10, Jack and Queen pay up to twice your total bet (bet per spin). The King and Ace pay up to four times your bet. The shield and the swords pay up to six times your bet. The evil sorcerer symbol and the skeleton symbols pay up to ten times your bet per spin. The knight symbol (your character) and the Wild symbol pay up to twenty-five times your bet plus they have an extra payout for x2 matching symbols! The Wild can stand in for all of these symbols when completing a winning set of symbols. When you play Treasure and Glory you will get the chance to go for glory when you spin three bonus symbols! The bonus symbol is very noticeable. It’s bright red with a golden hammer! Once you spin two, the other reels will light up to increase the tension to see if you will spin a third. When you get three, the bonus spins will begin. First, you’ll be given 15 free spins and before they start, you have to pick your hammer of choice. The hammer will represent the special symbol for the bonus game. The background of the reels during the free spins is a wall of the evil sorcerer’s castle! Every time your special hammer symbol lands, it will bash through the wall. If it lands on a spot it has already bashed through, it will just act like a normal symbol. All wins are paid double during these free spins! If by the end of the 15 spins, you manage to bash your way through the entire wall, you’ll have a chance to go for the treasure! The evil sorcerer stole this treasure from you and your village so now you can take it back. The treasure feature will enable you to enter the Treasure Room! Here, you’ll see 12 treasure chests in front of you and it will be your responsibility to choose the right one. Each treasure chest contains treasure equal to anywhere between 50 and 500 times your bet!